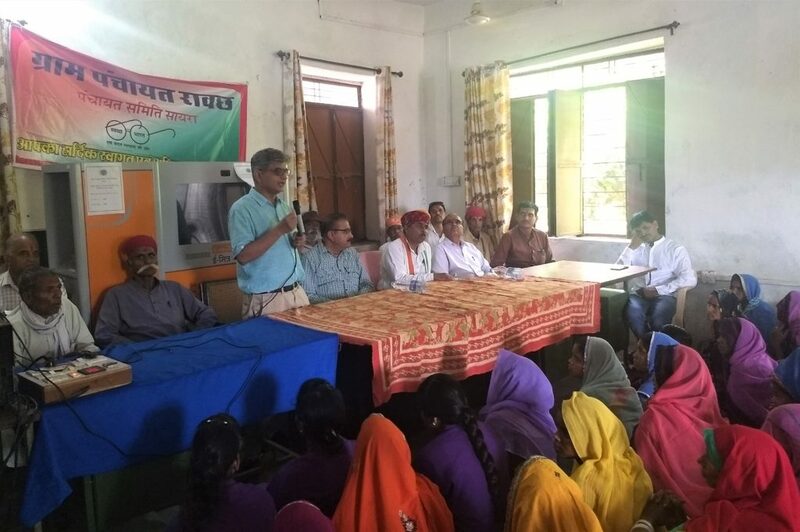 The 72nd Independence day was indeed a special one for Rawach, a village located in Gogunda Tehsil in the Udaipur District of Rajasthan . In the presence of approximately 300 residents AMRIT Clinic -an initiative by Basic HealthCare Services (BHS), in collaboration with Aajeevika Bureau (AB), was inaugurated at Rawach. This is the second clinic where BHS is providing Primary Healthcare in Gogunda – three clinics have been functioning in Salumber Block since 2013. With commencement of Clinic services at Rawach, BHS has extended it’s reach to a population of nearly 90,000 in under-served and remote regions. The baseline survey BHS conducted highlighted the need for quality and affordable primary healthcare close to the communities in Rawach and surrounding panchayats. The survey showed that over 65% of deliveries continue to take place at home which is highly unsafe for both mother and baby. Women have been pregnant as high as 9 times and on an average 4 times, thus also conveying the status of unmet contraceptive needs and crucial need for maternal and child care in this area. Half of the households surveyed had children who were not fully immunized. The unavailability of public health facilities pushes the villagers to resort to quacks, traditional healers and home based remedy leading to poor health and financial distress. With all these issues prevailing in the community , AMRIT clinics aim to provide low-cost , high quality primary healthcare services with dignity. Clinical services will be delivered by a set of three Primary Healthcare nurses who will be supported by physicians, health workers and development professionals. The Clinic was inaugurated by Dr Pavitra Mohan (Director BHS), Mr Mangi Lal Garasiya (Ex-Labor Minister), accompanied by Panchayat members and local leaders. The leaders addressed the gathering, highlighting the importance of health for their well-being, and its direct impact on the next generation, their growth and education. They also hoped that the nurses at the clinic, who come from tribal communities themselves, would be an inspiration for the children, especially girls, to seek education and drive a wave of change. AMRIT clinic Rawach recorded a footfall of more than 40 patients on the first day itself, showing the hope that the community has from the clinic and a faith that all their concerns will be addressed here. On this Independence day ,the people of Rawach hope for a healthier future and wish freedom from ill health and disease.